The tall granite obelisk commemorates the Poverty Point Gold Discovery. It was restored and re-erected on this site in 1954. 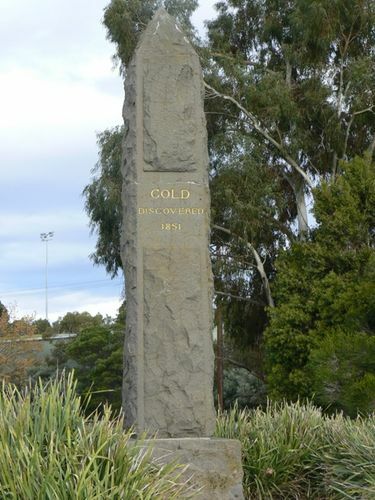 When the news spread of gold discovery at Buninyong, it was overrun with prospectors. John Dunlop and James Regan left and moved to Ballarat where they discovered a richer field on 21 August 1851. However a newspaper man had followed them and noticed their work. As a result, they only had the richest gold field in the world to themselves for a week. By the following year there were around 20,000 diggers searching in the shafts of the Ballarat Goldfields. Due to this population explosion, Ballarat was proclaimed a town in 1852. By 1855, Ballarat was a municipality, a borough by 1863 and a city in 1870. They did not receive any part of the rewards which had been offered for the gold discovery, although Dunlop`s wife remembered that he discovered his weight plus 14 pounds in gold. Dunlop later became a butcher and died in 1873. The monument is a tall granite obelisk, capped by a larger square stone.